Essential 5 Face Line by Specials | SKINourishment, Inc.
Purifying Clay Mask-(4 oz) Bentonite clay, Organic Oryza sativa (rice) flour, organic powdered herbs of Phaseolus angularis (adzuki), Citrus sinensis (orange)_peel, Citrus limonum (lemon) peel, Withania somnifera (ashwaghanda) root, Camellia sinensis (green tea), Rosa canina (rose hip) fruit, Cucumis sativus (cucumber), powdered Rosmarinus officinalis (rosemary) leaf. Invigorating Face Wash- (8 oz) Aqua (water), Organic Castile soap, organic Aloe barbadensis (aloe vera) gel, organic Olea europaea (olive) fruit Oil, Rosa mosqueta (rose hip seed) oil, Hippophae rhamnoides (sea buckthorn) berry oil, Rubus idaeus (red raspberry) seed oil, organic extracts of Equisetum arvense (horsetail), Tussilago farfara (coltsfoot), Withania somnifera (ashwagandha), Salix nigra (willow bark) and organic essential oils of Cedrus atlantica (cedarwood), Lavandula angustifolia (lavender), Mentha piperita (peppermint) with NON-GMO tocopherol (vit E). angustifolia (lavender) with NON-GMO tocopherol (vit E). Cooling Under Eye Serum-(1 oz) Organic aloe vera gel, organic Olea europaea (olive) fruit oil, Rosa mosqueta (rose hip seed) oil, Hippophae rhamnoides (sea buckthorn) berry oil, Rubus idaeus (red raspberry) seed oil, organic extracts of Equisetum arvense (horsetail), Tussilago farfara (coltsfoot), Withania somnifera (ashwagandha), Salix nigra (willow bark) and organic essential oils of Cedrus atlantica (cedarwood), Boswellia serrata (frankincense), Limnanthes alba (meadow foam), Lavandula angustifolia (lavender), Zingiber officinale (ginger) with NON-GMO tocopherol (vit E). Regenerative Face Serum-(2 oz) Polianthes tuberosa (tuberose) wax, Olea europaea (olive) fruit oil, Argania spinosa (argan) oil, organic, unrefined, Butyrospermum parkii (shea butter), Rosa mosqueta (rose hip seed) oil, organic extracts of Withania somnifera. (ashwagandha) root, Tussilago farfara (coltsfoot), Salix nigra (willow bark), Helichrysum stoechas (helichrysum), Panax quinquefolius (American ginseng), oils of Hippophae rhamnoides (sea buckthorn) fruit, Rubus idaeus (red raspberry seed), Cedrus atlantica (cedarwood), Citrus aurantium (petitgrain), Cananga odorata (ylang-ylang), Zingiber officinale (ginger), with NON-GMO tocopherol (vit E). These products can be used as a nightly face restoration regimen. Step 6: Have a fabulous day! Such good stuff! I have battled trying numerous lines supposedly good for you. My natural Dr. Turned me on to this company and their products. Love love love! Customer for life! My skin feels amazing! Thank you for making such amazing products! Kenda D. Reviewed by Kenda D.
I have used several products before- like climbOn Creme and others, but this is my first time to try Skinourish Face Line and I love it - especially the eye serum. It all feels so clean and fresh, and my skin is softer and looks healthier! Ellen J. 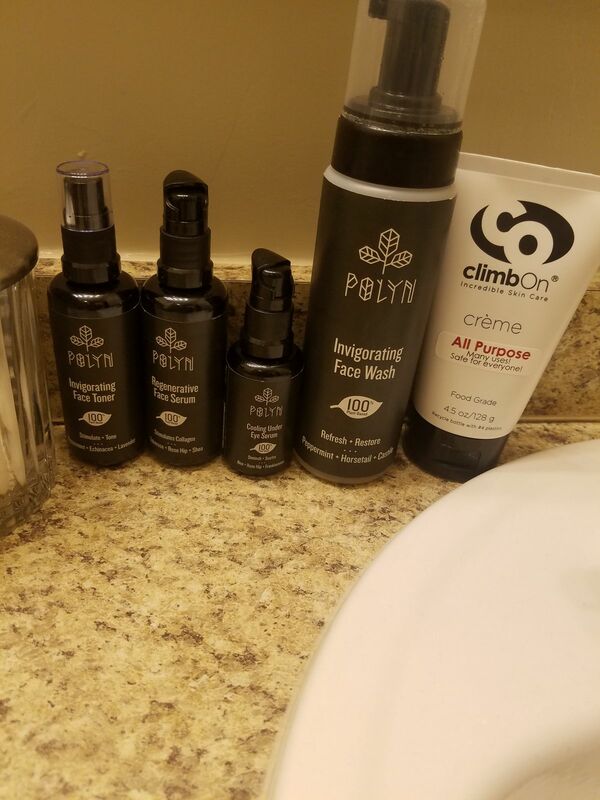 Reviewed by Ellen J.
I love all these products! My skin feels so soft and I love how clean my skin feels! I really like the face toner for a quick refreshing spray on your face! The face serum keeps me looking young! The face wash cleans my face good! Joey D. Reviewed by Joey D.
My niece moved to Austin about a year ago and stumbled across these facial products. She raved about them and when she came to visit me last winter she had some samples with her. After trying the face wash and face serum just a few times I was hooked. I ordered my own and within weeks I could see and feel a major difference in my skin. My skin is combination and I've never really found the right products until now. My skin is softer, smoother and more youthful than its ever been!! YAY!! What's even better is the all natural ingredients used that make these products completely safe for children and animals!! I highly recommend this line!!! Melissa A. Reviewed by Melissa A.
I thought about getting a facial at a salon but decided to get the Essential 5 instead. Boy did I make the right decision! I've used the face wash, scrub and tonic before but the addition of eye and face serum takes the experience and results to new levels. My face is happier and cleaner than ever. And the aromatherapy of each step is icing on top. Thank you for your wonderful products.